Join the discussion on our forums! Come discuss Wretched Tiller over in our dedicated Wretched Tiller discussion topic. 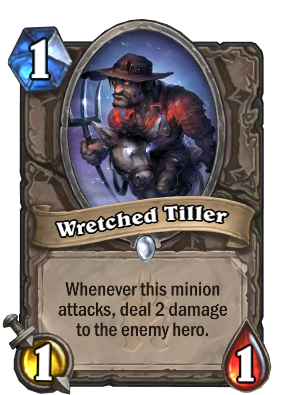 Whenever this minion attacks, deal 2 damage to the enemy hero. This minion has become a new favorite of mine. For a 1 cost card, it can be a very useful attacker. I've especially used this card in Priest and Paladin decks, although I don't see why it couldn't work for other heroes too. As a Priest, I try to buff his attack & health as quickly as possible. As a Paladin, I can often increase these buffs, but I also give him divine shields as much as possible. The main difficulty is keeping this minion alive long enough to be effective. Each time I play him, it's a risk. However, there have been matches in which this minion alone has taken the enemy heroes down less than half their initial health. It's a matter of keeping him alive long enough, and buffed as much as possible. this card is pretty decent against priest and warrior as it basically is guaranteed to hit the hero for 3 regardless. card basically is a guaranteed 3 damage by turn 2. should it survive it will continiue to do 2 damage to the hero "every time it attacks". also works good with cards that buff 1 attack minions. I fthis minion can survive long enough to get buffed up it can basically wreck havoc as it kills other minions and does 2 damage to the hero. give the minion windfury THATS 4 damage to the hero. also, if you need to trade and the enemy hero is low on health, even if tis minion is not buffed it will still do 2 damage to the hero. Not sure why everyone is knocking this card. it is certainly a better pick than snowflipper penguin in an aggro druid deck. also, it is a pretty decent replacement for raven once ONIK is out of standard. if only it had a beast tag. Predicting that blizzard will add some clan conversion next expac. changing one minion type to another minion type is a staple in most other card games after all. DNA Surgery on this card would definitely be cool for the beast tag. Golly bob howdy i am undead! Great play sound, cracks me up every time. Not bad in aggro decks actually, particular aggro druid if you add taunts and have no Patches the Pirate, it dishes out more pain better than Bloodsail Corsair alone, even if this card's stickiness is questionable. Even the art is bad. Golly bob howdy, I'm undead.. I'm surprised this guy isn't used in Zoo, I think he'll find a very welcome home there. Do you even zoo, bruh? The card sounds are killing me. I'm laughing so hard. I need two of these in every deck I ever make from now on. Steward of Darkshire and it is suddenly riot time against Evil. Why does this Yharnam donkey have your Bood Echoes?